Objective: To review our surgical techniques and determine early outcomes of jejunal interpositions in Esophageal Atresia (EA) patients following failed prior reconstruction. Patient Selection: All patients treated at our institution, between 2010 and 2015, that underwent a jejunal interposition following a failed prior esophageal reconstruction for esophageal atresia. Interventions: Anatomy, demographics, length of stay, operative techniques, and requirement for microvascular support were analyzed. Main Outcomes: Outcome measures included conduit survival, mortality, as well as feeding status at last follow-up. Results: Nine-patients met criteria. Median age at time of surgery was 48 months (range: 8-276 months) and median weight was 14.2 kg (range: 7.2-49.7kg). 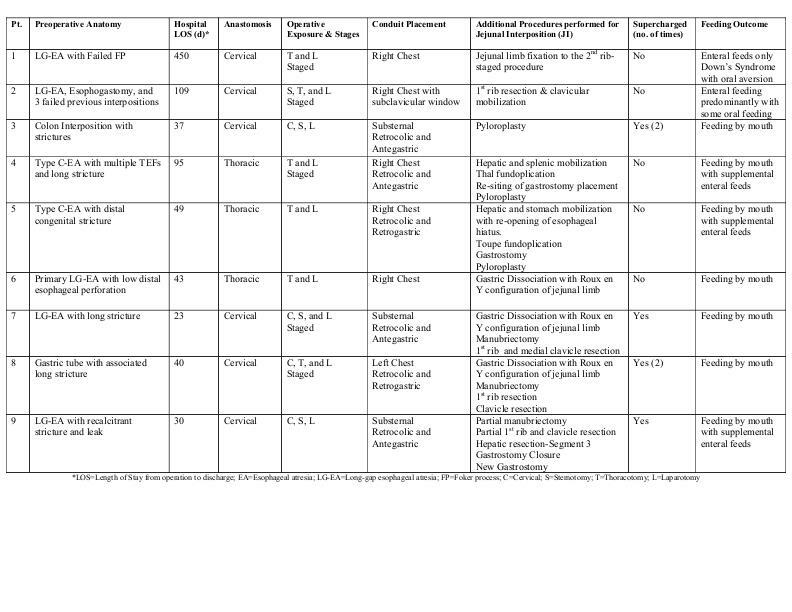 Preoperative anatomy, operative technique, ancillary procedures, and outcomes are in Table 1. Four patients required microvascular “supercharging”. Median follow-up has been 1.5 years (range: 0.8-5years) with no mortalities. Four are eating by mouth, 3 are eating primarily by mouth with supplemental enteral feeds, and 2 patients are enterally fed. Conclusion: This is the largest series of jejunal interpositions following failed previous attempts at restoration of esophageal continuity in pediatric patients. All jejunal conduits are functional with no mortalities. Lessons learned include: necessity of a multidisciplinary team and a flexible approach; conduit survival may require additional vascular support; and, thoracic anastomosis may be a favorable alternative to span shorter, segmental gaps. First-rib, clavicular head, manubrium and liver resections, as well as gastric dissociation, may also facilitate reconstruction.